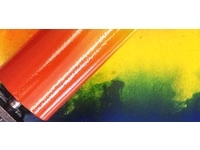 Tramway presents PRINTSHOP! an exhibition, free drop-in print studio and workshop conceived by artist and printer Edwin Pickstone for Tramway’s front T5 space. Printshop! 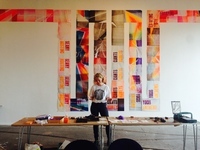 plays host to a series of exciting free weekend workshops focused on screen-printing, letterpress and book binding devised and led by a host of different artists, makers and designers. On the walls of PRINTSHOP! 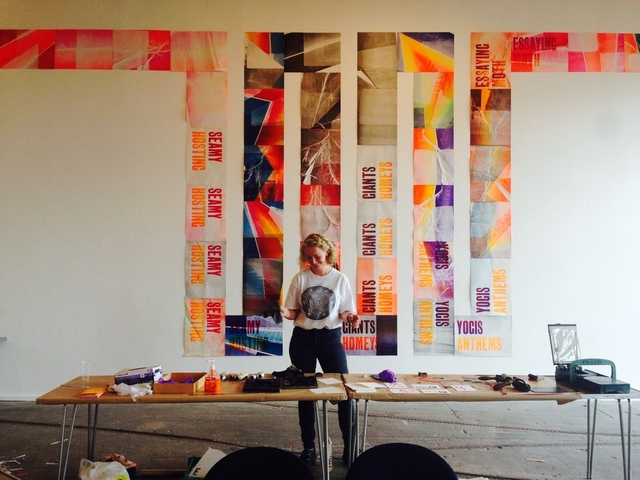 a collaborative artwork produced by Edwin Pickstone and Ciara Phillips will be joined by other elements that will accumulate through the process of making over the two-week duration of PRINTSHOP! Phillips and Pickstone's piece itself was created by using various letterpress printing techniques to create a snaking ticker tape strip that winds around the space negotiating the room’s peculiarities. The form and text employed in the artwork explores the techniques, typefaces and history of the letterpress process to investigate the intersection of design and art and the different approaches of the printer and printmaker. Phillips and Pickstone, are both tutors at the Glasgow School of Art in the Fine Art and Design departments respectively and the work presented in PRINTSHOP! was formed from a conversation that developed over several months around the relationship between their own print design and fine art printmaking practices.